Oh, what a week! Moved into the new apartment, friends and family visiting from out of town, the first day of spring on a snowy day, and a wedding too! I still don't have the internet at home, so as I sip on a beverage I am updating from down the block. Our new apartment is quite frankly.., probably better than yours. ;) Well, maybe not but it's pretty d**n awesome. I keep moving from room to room thinking, "This room rules.., it's my favorite!" Then I walk into another room, and say to myself, "Hmm.., I love this room. Maybe this is my favorite!" In any case, we love it and love decorating and debating where Davey will hang his Cure poster and where I will hang my Baltic Tapestries (I don't actually have them, yet. But I'm working on it). Good thing we both have a good sense of humor. 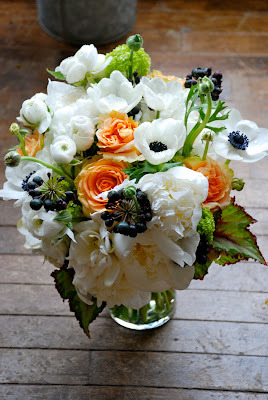 This is an image of a bouquet I made for our kitchen in one of the glorious milk glass vases I boast about. 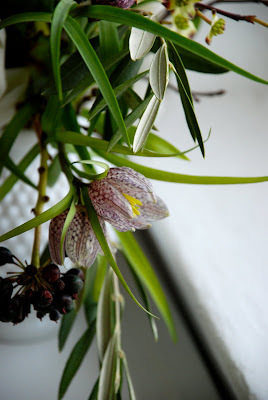 It is filled with peonies (one of my three favs), fritillaria (That looks like a ska kind of thing), olive branches, dogwood (!!! ), and anemones.., of course!